The must-read guide to Finse and the Star Wars filming locations. 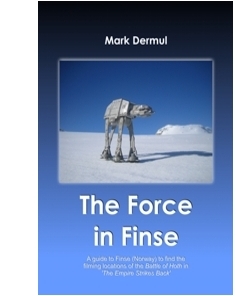 I have written a 70-page guide, aptly named 'The Force in Finse', containing all the information you need to undertake this expedition yourself. You can purchase it by clicking on the image. It is written in English and choke full with color photos of the 2005 expedition. The book is 20 EUR + 5 EUR shipping. All the proceeds are invested in the next expedition. You can order a copy of the book on Lulu.com, or - if you live in the US - get it from Amazon.com! For a signed copy, simply contact me. Star Wars fans all over the world often wonder where their favourite movies were shot. Not much is known about the remote ice-world of Hoth as seen in ‘Episode V – The Empire Strikes Back™’. This book is a detailed guide for an 8-day journey over the Hardangerjøkulen Glacier in Finse, Norway. In clear chapters, find out what to bring and what not, where to book and how much your trip will cost. In short : everything you need to know to prepare yoruself for this freezing expedition. Filled with photos in full color of the 2007 expedition. When travelling the icy plains of Hoth, you really want to make the greastest effort to prepare yourself as best as you can. First and formost, you need to get into the mood. You can do that by watching the movie again! Then you can read the novel, the comics or any other book about the Ice Planet of Hoth. Aside from my book 'The Force in Finse', it may be a good idea to check on other sources to find as much info as you can get on the Norwegian shoots. It would be a shame to be standing in the middle of this Star Wars location and not knowing it! These resources will provide you with great information, both on the Star Wars location shoot and surviving the cold environment of Norwegian's Hardangerjøkulen Glacier. Therefor, check the column on the right-hand side for more resources. In the meantime, enjoy this exerpt from 'The Force In Finse'. These are the locations on the Hardangerjøkulen Glacier that were used by the Norwegian unit in 1979 for the filming of the Hoth scenes in the Star Wars hit movie ‘The Empire Strikes Back’. The plain where the AT-AT surface attack is led by General Veers against the entrenched troopers of the Rebels, trying to protect the Shield Generator and Echo Base. This location is very easy to find, as it can be partially seen from the hotel. When you look out from Finse towards the glacier you will see a rigde of snowy mountains. The plain in front of it is the battlefield that was filled with turrets and radar laser cannons. In summer the glacier forms a "tongue" that flows down between two mountain peaks. Seen from Finse, the one on the right is seen in many publicity stills of the Rebel base. The actual entrance to the Rebel base is impossible to find, for it does not really exist. This was a matte painting, based on a production painting by the artist Ralph McQuarrie. Basically, a shot was taken of the mountain rigde on the glacier and matted in with the matte painting (that was produced by Harrison Ellenshaw, by the way). But a part that we should be able to find is the ‘backdoor’, through which Luke escapes to find his X-wing waiting with faithfull Artoo. There is a small hill between the glacier and Finse. This was used for the shot where Luke walked down a hill towards his waiting X-Wing. When the Falcon escapes from the hangar and climbs to the sky, in reality it would do so from right to left. So, technically, the Falcon launches towards the Rebel base instead of away from it. The shot was realised with what is known as a film flip (by the way, if you look closely at the scene, you’ll see that Luke’s eye-line is wrong – he’s actually looking ahead of the Falcon), making the Falcon seem to fly away from Echo Base. 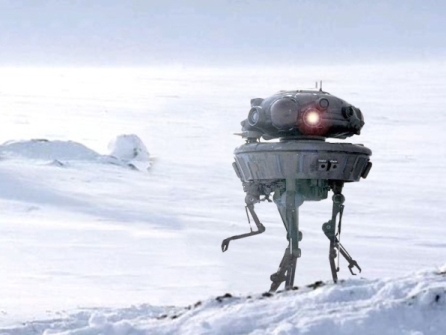 This is the site where the Imperial probe droid crashlands in the snow. We see it emerge from the crater and then slowly float away, scanning the area for lifeforms. In summer the glacier forms a "tongue" that flows down between two mountain peaks. The one on the left is the mountain that´s seen behind the probot when it hovers away from it´s crashsite. You should be able to spot it easily. The shield generator is seen briefly in the distance in a few scenes. It is the objective for General Veers and his AT-AT’s during their surface attack. Obviously the actual generator was never there, it was matted in by the SPFX people. It’s situated at the far end of the plain that was used as the battelfield. Han Solo eventually rescues Luke from the devastating cold by putting him into the warm inside of the Tauntaun. He then sets up a tent and is found the very next morning by Zev Senesca (Rogue 2). This shot was also taken on the plain, but from an opposing angle with the sun coming up, thus creating a different view of the glacier. The first part of this scene, however, was shot right outside the hotel! The shape of the snow is so completely different every year that it would be very difficult to recognize anything. You’ll need a lot of imagination and goodwill. The best reference will be the darker parts of the mountains, surrounding the glacier. When Luke is heading to his waiting X-Wing Fighter with his trusty Artoo unit, he hears the Falcon lift off and watches as it soars along the icy plain. We will be standing in the exact same spot and watch the Falcon do it all over again. Han Solo & Chewbacca check out the metal intruder and find out it’s a Probot, an Imperial probe droid. They shoot it at this location, but it obviously self-destructs, cause Solo didn’t hit it that hard. The must-read guide to Tunisia and the Star Wars filming locations. I have also written a 90-page guide 'Trip to Tatooine', containing all the information you need to undertake and expedition to Jerba & Tunisia to enable you to discover the filming locations used by Lucasfilm to create the desert world of Tatooine. The book is 20 EUR + 5 EUR shipping. All the proceeds are invested in the next expedition. You can order a copy of the book on Lulu.com, or get it from Amazon.com! For a signed copy, simply contact me. These other resources will help you prepare for the trip of a lifetime. Check out pages 122-132 for some great reference shots. Great on-location photos on pages 45-60. The Art of The Empire Strikes Back. Some of the matte paintings come directly from the Finse landscape. The novel - 'nuff said. A Journal of the Making of The Empire Strikes Back. The best source of information on the early filming days in Norway. Pages 1 through 35. Not very interesting as resource, but gets you in the mood! Arnd Riedel, a personal friend from Germany, visited the glacier. Great photos on pages 60 through 63. Great info on the glacier you'll be visiting. Great info on all things Noway, including trekking in Finse. Well? You'll need to communicate, won't you? The movie - check out the bonus DVD is you have the boxed Trilogy set. Rare making of video with lots of great footage. This will get you into the mood! 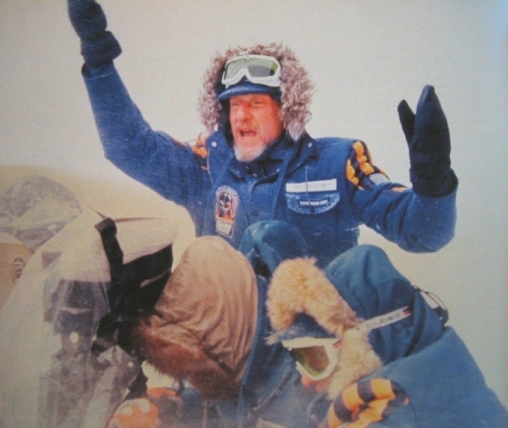 Great source of information on Hoth, the vehicles and behind-the-scenes info. Take it with you on the glacier!